In the world of digital multimeters, the Fluke 117 is a staple product. Its users rave about the speed, reliability, and build quality of this True-RMS meter. In this review, I will take a closer look at the Fluke 117 and let you in on all its features and specifics. If you’re considering buying the Fluke 117, this review will help you decide if this digital multimeter is perfect for you. Who is the Fluke 117 for? The Fluke 117 is the last model in the ‘110’ digital multimeter product line from Fluke. This relatively cheap product line offers four digital multimeters for different specific purposes. The Fluke 117 is the most extensive model and is geared towards electricians working before the box. It offers a variety of features that fit the everyday life of an electrician, but also comes with a non-contact voltage meter, so you don’t have to actually touch a live wire to carry out your measurements. 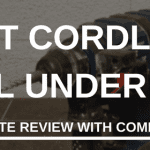 This feature can literally be a life saver, and although most electricians have the tools to do this, having it included in your multimeter can save you lots of time. Aside from electricians and other professionals, the Fluke 117 has a great track record for hobbyists and DIY-ers. If you’re looking for a solid multimeter that outperforms cheaper brands and models, but still doesn’t cost you an arm and a leg, the Fluke 117 is a great choice that will last you years. The Fluke 117 comes with a yellow rubber case that prevents damage when you (inevitably) drop the multimeter. The hassle-free package is easy to open without any tools, and the box includes the usual paperwork to register your product, two test probes, and a very thorough manual. The cables for the test probes have a little bit of wiggle room on each end, which will extend the life expectancy for the leads. Fluke claims that the 117 is designed by electricians, and a quick look at the model’s features can confirm that it is engineered with an electrician’s day of work in mind. It has automatic voltage selection. This doesn’t just give you fast, automatic readings, it also adds to the minimalist design of the multimeter, making it even easier to operate the multimeter with one hand. Another feature that will prove extra helpful for electricians is the low input impedance. This means that the Fluke 117 will recognize ghost voltage and prevent false positives. Add to that the non-contact voltage meter we mentioned earlier and the fact that this is a True-RMS meter that will also give readings on non-linear loads, and you’ve got a well-rounded digital multimeter that is a valuable addition to any electrician’s toolkit. Aside from those specific features, the Fluke 117 offers a good array of standard functions as well. It measures DC and AC voltage (millivolts and volts), can perform continuity, diode, capacitance, and resistance tests, and has a 6,000-count reading with 4 updates per second. To get the most out of your Fluke 117, the extra electrician-focused features must appeal to you. Like other Flukes, the reliability and speed of this multimeter adds to the ease of use for your tasks. Unlike some cheaper models that offer non-contact voltage meters, this feature works great on the Fluke 117. Although the test leads will do for most people, one way to get a much better experience with the Fluke 117 is to upgrade the test leads. You can buy better leads such as the TL175s for around $25, and this will much improve your overall experience. Again, there is nothing wrong with the leads that come with the Fluke 117, but if the upgrade is worth it to you, you’ll get more out of your multimeter with improved leads. The Fluke 117 is a brick house. It’s fast, reliable, and built to last. On the inside, the engineering holds up to critical standards, and the quality of engineering is much higher than other multimeters that are built in China. There are, however, two groups of people who should look elsewhere when considering a multimeter. The first group of people is those who don’t need all the specific features on the Fluke 117. Although it is undeniably the best multimeter within its price range, there are other multimeters that will deliver a solid performance with a few less features. The other models in the Fluke 110 range all deliver the same quality readings and reliability, but don’t cost as much as the 117. If you never plan to use the non-contact voltage meter, or all your work takes place ‘behind the box’, you can safely scale down a little bit and pay a good price for a multimeter that better fits your needs. The other group of people needs more out of a multimeter. Although the 117 is jam-packed with features, it doesn’t hold up to a higher standard. It won’t perform as well past light industrial equipment and lacks the CAT-IV safety rating that are a requirement for some professionals. 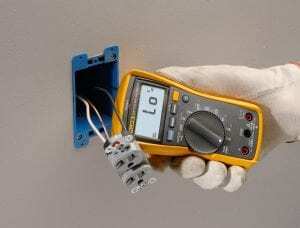 For those people, the more extensive (and expensive) Fluke-87V might be the better choice. Download Fluke 117 True-rms Digital Multimeter User Manual – Here! Related posts about Fluke 117 True-rms Digital Multimeter in Forums – Here! The Fluke 117 is a great multimeter. It offers good features and superior readings. The building quality is superior to other brands in the same price range and even warrants the slightly higher price compared to other multimeters you might consider. If the features that the 117 offers fit your demands, there is no better option than the 117. The only two reasons for not buying a Fluke 117 would be if you demand more of a multimeter and can make the investment, or if you simply don’t need all the specific features that the Fluke 117 has to offer. For anyone else, this multimeter blows every other option out of the water. NiCad vs. Lithium-Ion Battery: Which is better for cordless tools?